Description: This plant is most commonly known for its tolerance to environmental stress, but especially for its tolerance to low light. This plant’s succulent leaves grow vertically and have sharp pointed tip, and smooth, beveled edges. Leaves are a variety of green colors, with some varieties having yellow or white variegation. The large leaves on this plant have been shown by NASA to filter formaldehydes, and other compounds known to be harmful to humans, from the air, making it an excellent houseplant. Watering: This plant prefers to have the soil dry out completely in between watering during growing season as it is a succulent. Reduce watering in the wintertime and avoid keeping the soil moist for extended periods of time. Overwatering is the most common problem with cultivation of this plant. Fertilization: Fertilize with any general-purpose fertilizer every 4-6 months. Lighting: This plant will grow well in almost any lighting situation. Avoid long periods of direct sun exposure. 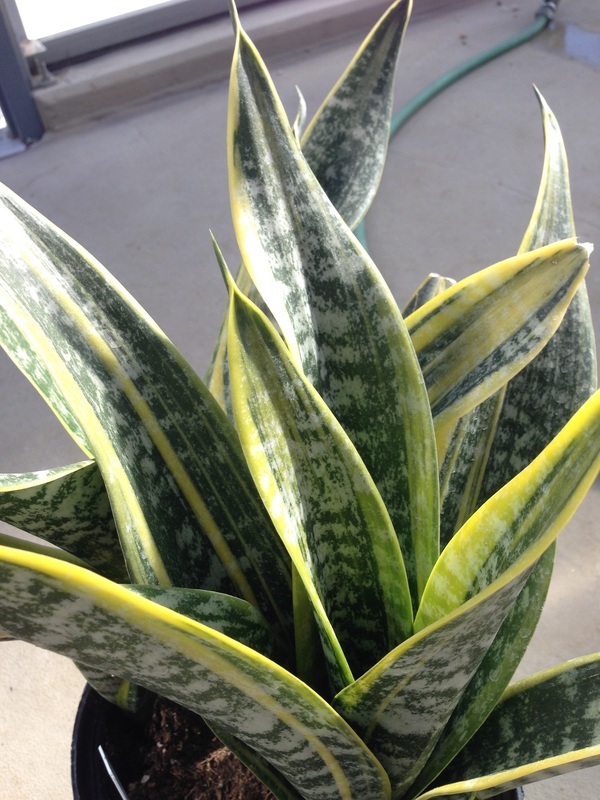 Use: Sansevieria is valued as an interior foliage plant, and for its benefit in air filtration. Propagation: Placing leaf cuttings with added rooting hormone in moist vermiculite is an effective way to propagate this plant asexually. Vermiculite should be kept moist but never water logged. Expect cuttings to have taken root about 2 months. Cuttings of variegated varieties may not retain the variegation patterns on new plantlets.